Are you counting down to the school holidays? I know I am. 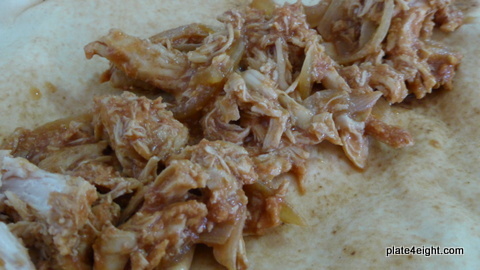 And I’ll be needing some quick and filling lunches to keep my bunch happy and this BBQ Shredded Chicken will do quite nicely. It’s a crockpot recipe which means it’s a time-saver and it’sperfect for a relaxed weekend lunch, quick dinner before the kids head out for after school activities, or in my case feeding a crowd during the holidays. We usually serve ours wrapped in tortillas, but I think it would be perfect on fresh crunchy bread rolls. Scatter the onions on the bottom of your crockpot. In a medium bowl, combine the tomato puree, vinegar, mustard, molasses, onion powder, cumin, garlic powder, tabasco and salt. Pour the sauce over the chicken and cook on LOW until the chicken is cooked through and shreds easily with a fork. Remove the chicken from the crockpot and shred with two forks. Return chicken back to the crockpot and stir to coat completely with the sauce. Serve hot wrapped in tortillas or on fresh bread rolls that you have heated in the oven to make them nice and crunchy. Notes: Cooking times will vary with each crockpot.